illian contacted Princess Valaria six weeks before her wedding date to ask if she could make her day a dream fairytale wedding. 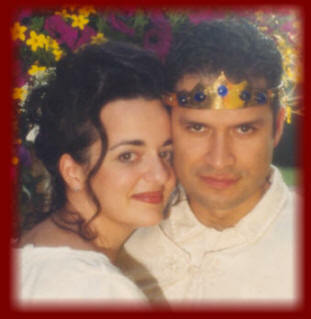 Princess Valaria organised Jillian and Nestor's special day without even meeting her as she lives in New York. With endless phone calls and emails their special day finally arrived. 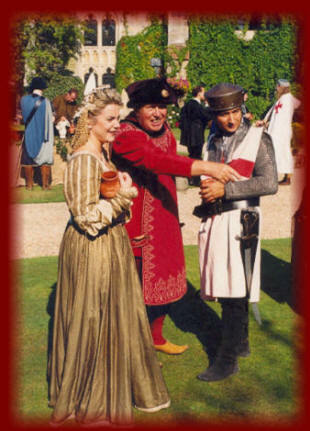 Lady Jillian and King Nestor (he was made a king on his wedding day as a surprise) invited guests from all over the world, they travelled thousands of miles to come to Jillian and Nestor's special medieval day. Both the bride and groom arrived on horse back with men at arms guarding their way, Royal minstrels played their entrance and their guest were adorned in the finest gowns. All were in awe of how beautiful they all looked. 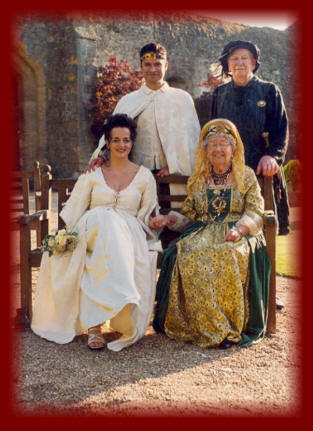 All the guests were entertained before the main feast in the courtyard of Amberley castle the venue they had chosen for their special day. Jillian and Nestor were joined together in a Celtic ceremony and then everyone took part in flying magnificent birds of prey and a medieval archery tournament. They watched sword fighting displays and were greatly entertained by the jester/juggler. They then made their way down to the beautiful medieval tent which set the scene for their medieval day. As everyone settled down to a feast second to none and entertainment from the royal minstrels it was indeed a splendid day for everyone. 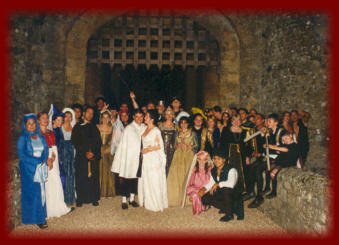 As dusk settled the guest watched fire shows and wandered around the grounds of the castle to finally end their night with medieval dancing in the courtyard and as the guests left through the portcullis to bid them farewell it was to be a wedding day they would never forget. A little surprise was in store for Jillian and Nestor as they were to retire to their bed chamber as Princess Valaria crept up to their room and placed small hand made butterflies on their four poster bedding and curtains and left them a special gift. So every time the Princess sees a butterfly in the kingdom it reminds her of that special day, Five years on Jillian and Nestor still keep in touch with Valaria to see how the kingdom is keeping Jillian and Nestor's comments were Awesome just awesome..!